Enya: "Well, the hymn is two hundred and fifty years old, and it was introduced to me by Nicky, and working on it in the studio I felt, and the last verse, it was such a pity to sing “How can I keep from singing?” and to finish, so I started to hum a little melody that the piece made me feel, that would suit it, and therefore I started composing little parts of the melody to complement it, and the more I would sing and work on it, the more it became more an Enya track." Enya and her record company were sued for copyright infringement by Sanga Music, Inc. for recording this "traditional" number because she had mistakenly credited this track as a "traditional Shaker hymn," thus assumed it as public domain. The third verse was, in fact, penned by Doris Plenn in 1956, who learned it from her grandmother, who claimed it had been written in the early days of the Quaker church. Folk legend Pete Seeger helped make the song fairly well-known in the 1950s by publishing it with Plenn’s additional third verse in his folk music magazine Sing Out! (Vol. 7, No 1. 1957), recording it, and mistakenly credited it as a "traditional Quaker hymn" without copyrighting Plenn’s verse, thus presenting the entire song as "public domain." It was again published by Sanga Music, Inc. in 1964. Its origin and controversial legal status was later clarified and settled in court in 1992: it was neither a traditional Shaker nor Quaker hymn—it’s actually a Sunday School song written by Rev. Robert Lowry that was published in a songbook he edited titled Bright Jewels for the Sunday School (New York: Bigelow & Main, 1869). 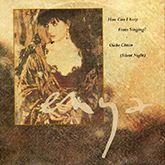 Because Seeger presented the new verse as being public domain, the court decided that Plenn had lost her rights and Enya could use the verse without paying royalties. 01 How Can I Keep from Singing? The ‘How Can I Keep from Singing?’ music video was shot at Poison Glen in Donegal. It includes archive footage of political figures such as Nelson Mandela or Boris Yeltsin, and references to the Gulf War and famine. The video leaves out the middle part of the song.